Tmt. M. Vijaya Lakshmi I.A.S Collector and District Magistrate, Ariyalur is an officer of IAS belonging to the batch of 2009. She did her graduation in Zoology and entered into Tamilnadu state government service as Municipal Commissioner in 1992. 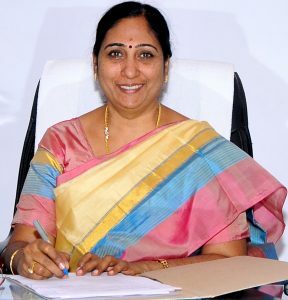 She has vast field experience in the urban sector and worked in the municipalities of Sathyamangalam, Mettupalayam, Udumalpet, Rajapalayam and Karur, Joint Director of Municipal Administration, Tiruppur region, Corporation Commiossioner of Erode and Tirucirappalli. Erode Corporation has been awarded for “Best Corporation” by the Hon’ble Chief Minister of Tamilnadu for the year 2012-13 and Tiruchirappalli Corporation was ranked 3rd in the Swachh Survekshan by Govt. of India during her tenure. She was worked as Sub Collecctor, Coimbatore and Deputy Commissioner of Health, Chennai Corporation. As Collector of Ariyalur, Education, Nutrition and Health are the core areas to be concentrated in the district for the welfare of the people.